Charlie Trafford (right) wants Caley Thistle to aim for the Championship summit. 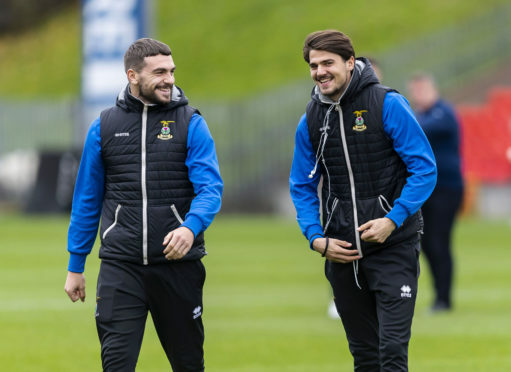 Caley Thistle midfielder Charlie Trafford says the Highlanders have reignited their Championship promotion aspirations by returning to winning ways last weekend. Inverness defeated Partick Thistle 1-0 at Firhill to end a sequence of seven straight draws, taking the club’s record-breaking unbeaten league run to 24 matches. Despite Caley Jags’ frustrations at going nearly two months without a victory, Canadian international Trafford feels the long-awaited triumph has allowed John Robertson’s fourth-placed to focus on bridging the eight-point gap between themselves and leaders Ayr United. Trafford said: “It was an unbelievable feeling to get the win. We were frustrated and the fans were frustrated – but it is a pretty exceptional run we’re on. “We’re sitting fourth in the table when, last year, we were already fighting near the bottom. “We always knew, though, we were close to the win and capable of it in every game. Last week we got the goal, Mark Ridgers made the penalty save – something that, a couple of weeks ago, doesn’t go our way. “With extra confidence from that win, hopefully we can kick on now. “We’re definitely only looking up. After 24 games unbeaten, you don’t go looking over your shoulder. Caley Thistle are aiming to record back-to-back victories when they make the trip to Queen of the South today, with the sixth-placed Doonhamers four points behind Inverness. Trafford is relaxed ahead of the trip to Dumfries, adding: “Football is a crazy recipe and there are so many different factors, but I think we’re on the right track. The spirits in the locker room are good. “It’s a long season and a tight league where everyone is beating everyone. We’re nowhere near the stage of it being make-or-break if we don’t win. “I wouldn’t say it’s difficult to deal with the pressure of the unbeaten run. The unbeaten run is nice to be part of and something to be proud of, rather than a burden. Trafford made just his fourth league start of the campaign against the Jags last weekend, with the 26-year-old hopeful his patience has paid off in his hopes of a sustained run in the side. He added: “It is about the team winning, I want to win the league this year. I had a bit of a frustrating few weeks there not playing. The team were drawing but obviously wanted to win those games, so I tried to stay patient and as sharp as possible. “It isn’t easy sitting it out and you have to work back to the right level of sharpness and match fitness.